Seignosse has two centers, Seignosse Bourg (town centre, which is 4-5 kms away from the beach) and Seignosse Beach. The Village of Seignosse is typical of the old Landes coastal villages, picturesque, quaint and with the village church, the Town hall, a few bars, hotels and small lanes with scattered typical Landes colombage farmhouse architecture, and on the outskirts of this, some developments of new houses. Nothing different then you may ask? and the answer would be yes. Two very large Lakes exist just to the North of the Village which makes all the difference, the "Etang Noir" (Black pond or lake) and the very much larger "Etang Blanc", all surrounded with the Landes natural pine forests (very tranquil, calm & relaxing). Hidden down the lanes surrounding the lakes and nestling in the pine trees, are a few very isolated Landes style restaurants with views over the lakes. Between the Etang Noir & the Village is a large Sports Centre with several activities (Pelote Basque, Tennis Courts & arranged Cycling Tours, some short, some long, around the area (this area of the Landes has especially concerned itself with the cyclist. Adjacent to all main roads from Capbreton to Moliets, they have constructed independent cycle roads for the safety of all)) and between the lakes is an Equestrian Centre (Pony Club, which arranges regular promenades into the Forest for the avid Horseman (or woman) on Horse back). 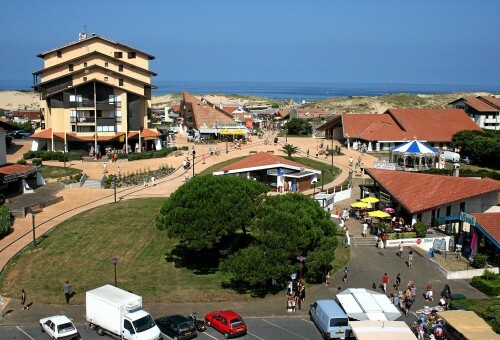 Seignosse Plage is a vast area of apartments with the centre at Penon Plage, where you will find Bars, Restaurants, a cinema (showing films in French, of course) a disco and the Water Park. All kept in impeccable trim, with what must be an army of gardeners (it reminds me and has the appearance of a large Alpine ski resort, with the snow replaced with very fine white sand). The coast line has immense beaches (deep & long) & enormous sand dunes, enough space for all. Between the village and plage is the most immaculate Golf Course ever imagined or constructed with lakes & ponds creating hazards for the most discerning golfer, with the most beautiful modern Landes style houses nestling between the pine trees and the fairways of the Golf Course.